The Malaysia medical tourism industry is at a booming stage at present, states Transparency Market Research (TMR) in a research report. This boom is likely to contribute towards the rise of fierce competition among the top players present in the market. As the Malaysia medical tourism market is moving towards maturity, numerous prominent organizations are looking to deliver dynamic changes in their products and services in order to maintain a sustainable growth in their charts. In spite of the presence of several companies, the Malaysia medical tourism market is expected to exhibit a higher degree of consolidation, with the top drawer companies holding the nub. The cream companies present in the Malaysia medical tourism market with a firm hold are Island Hospital, Sunway Medical Centre, IJN Health Institute, Prince Court Medical Centre, and KPJ Healthcare Berhad. These organizations are focusing expanding their regional footprint and emerge dominant with a large consumer base. One of the key strategies of the organizations who are looking forward to establish a firm hold in the medical tourism market in Malaysia is expanding the customer base in foreign. 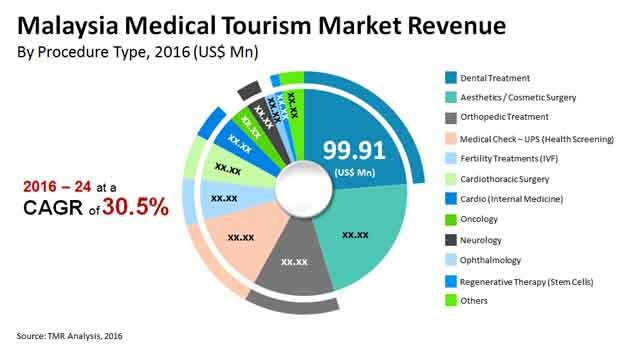 According to a TMR analyst, “The Malaysia medical tourism market is anticipated to rise at an outstanding CAGR of 30.05% from 2016 to 2024. Rising at this whooping pace, the market is estimated to touch US$3.5 bn by 2024 from a worth US$424.96 mn in 2016. On the basis of procedure type, dental treatment dominated the Malaysia medical tourism market in 2016. The dental treatment segment was closely trailed by the cosmetic/aesthetics surgery as the second-leading segment in the same year. Over 36% of the medical tourists in Malaysia choose dental treatment owing to factors such as favorable activities and investments by governments and low cost of the services in comparison to the once offered in the U.S. Other than this, the medical tourism market in Malaysia is likely to witness a rise in the demand for regular health screening, cosmetic surgeries, and orthopedic treatment. Dental treatment along with these segments held a share of over 70% in the medical tourism market in Malaysia in the past. Based on country, the arrival of medical tourists from Indonesia has been recorded being the maximum. Additionally, Malaysia is also the base of medical travelers from the U.K., the U.K., Australia, Libya, Iran, Nepal, China, and India, with the numbers soaring each time. The nation leave no stone unturned in order to attract foreign patients from these countries and other foreign countries. To flourish their medical tourism sector, the Malaysia government has also introduced the Malaysia healthcare travel council (MHTC). The country also attracts medical tourists from countries in the Middle East with provision of halal medical services and other Muslim friendly services. In comparison to developed economies of Europe and North America, the medical services provided in Malaysia are inexpensive in nature. Other than this, incessant activities and initiatives being undertaken by the government is expected to present more lucrative opportunities for market players to flourish in the Malaysia medical tourism market. Other macro-economic factors such as decent convalescence facilities, tax incentives, and good transport facilities are further expected to support the growth of the medical tourism market in Malaysia. However, the market is likely to face threats from the rising cost of healthcare and low income generated per patient.